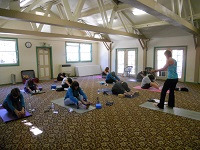 Alpine Meadows Retreat Center offers an array of meeting lodges and meeting facilities to suit gatherings and events of all sizes and occasions. Meeting spaces can be configured to fit your group's specific needs – be it one large space for 200+ participants, or smaller spaces for breakout meetings, seminars, meditation or religious services. 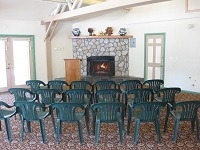 View photos of our meeting lodges. Eagle Lodge - Seats 200+ and can be divided into four parts by temporary walls. LCD/TV/DVD rental is available. Firewood is also available for an additional charge. 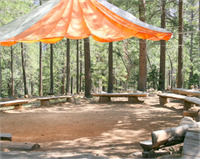 Lodge assignment is based on minimum/maximum group size stated on contract. Conversations is a great icebreaker game for small groups to interact with everyone.